Matthew 9:38: Pray ye therefore the Lord of the harvest, that he will send forth laborers into his harvest. The Apostolic Church International Fellowship of South Africa fully believes in the doctrine of the bible writers,prophets and apostles.There is ONLY one God and His Name is Jesus. 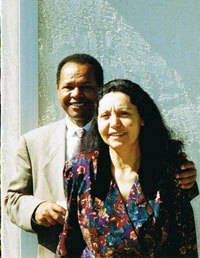 Bishop Degu Kebede- Chairman ACIF,with his wife. For there is ONE God,and ONE mediator between God and men,the man Christ Jesus.